As we entered into the fall of 2013, we realised it was time to make a final decision. 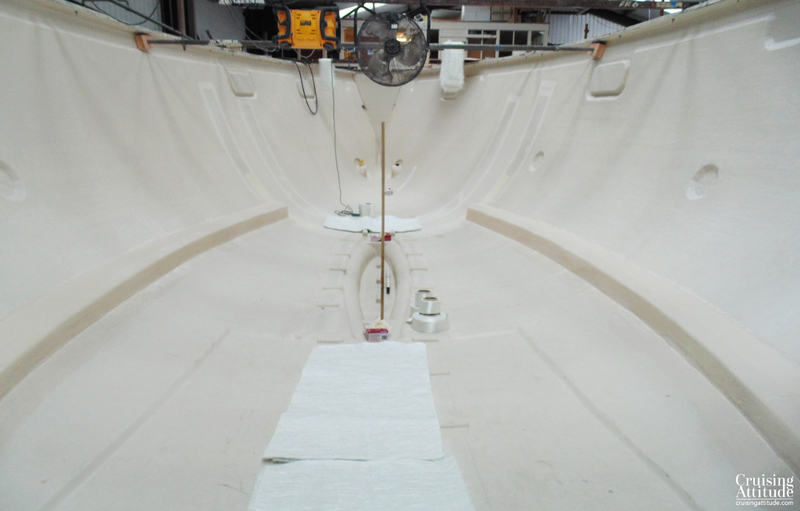 All three boats that we were interested in had combined waiting list and building times of up to 18 months and we wanted a boat for early 2016. 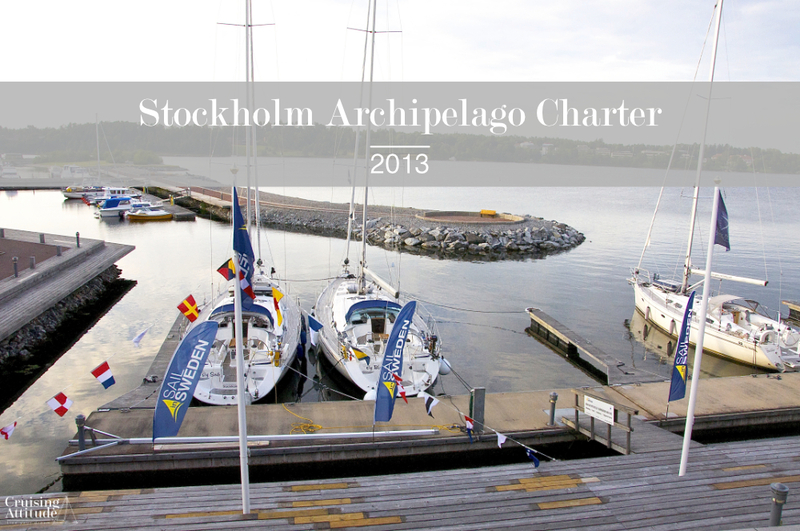 All three boats, the Discovery, the Hallberg-Rassy, and the Regina af Vindö fulfilled all of our original requirements. The most important reason for our choice was that the Discovery is a semi-custom build. It was not the most expensive of the three. During our first meeting with the yard as “owners”, we realised that building a Discovery was going to be a lot of work for us. There were a million possibilities in terms of options and customisation.. We had researched and discussed lots of good ideas to steal and bad ideas to avoid on other boats. We wanted to incorporate the good ones into our boat. 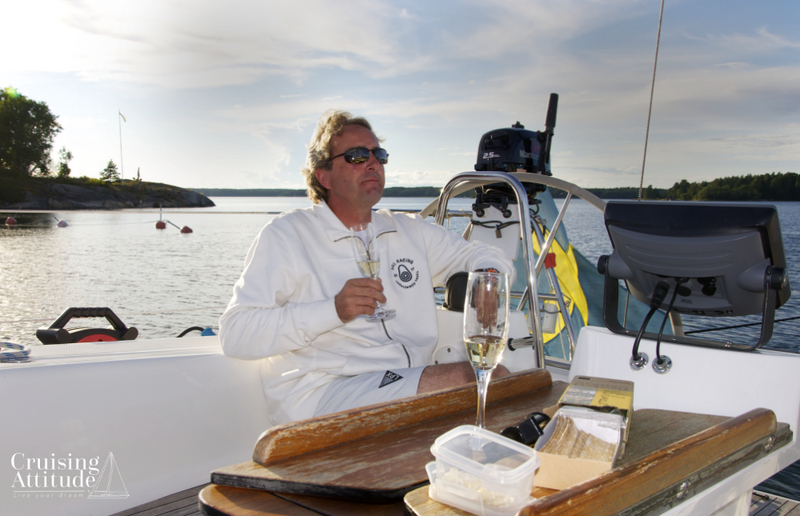 For example, we found out that we despise rounded-off, oval-shaped dinettes while sailing the Bavaria 40. Why? Because our favourite activity at the end of the day is putting our feet up with a good book and a cup of tea or a glass of wine. In the cockpit, that’s easy, you lean against the cabin wall and put your legs up on the bench. Inside, if the saloon is oval as they are in most Discoveries and recent Oysters, you can’t lean against anything flat. So we requested a rectangular dinette with perfect 90° angled corners. 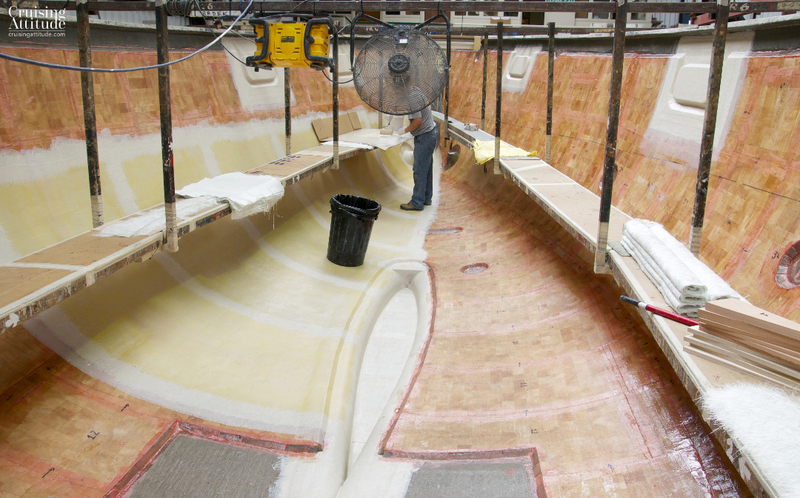 At the time of signing the contract, we needed to have decided on four things to begin the design process: the colour of the hull, the hull option, the keel option (regular or shoal) and the choice and size of anchor (because the anchor determines the stem head design). The only thing that is always the same for each Discovery 55 is the hull form, although there are two options — for either vertical or horizontal windows in the rear cabin. The the vertical ones are larger, we thought the horizontal ones looked more balanced. You can choose any colour you want and we chose the classic and elegant navy blue that most Discovery owners have chosen. At first we wanted a white hull, thinking that the dark blue would make the interior of the boat hot during a sunny summer day. But after speaking with John and checking with some other owners, we felt assured the insulation was thick enough to prevent this, and we changed our minds. The weighed tip of the Spade gave us more confidence of good performance in the sea-weedy anchorages you’ll find in some parts of Scandinavia. After reading the excellent advice of John Harries over at the Attainable Adventure Cruising website, we specified an oversized 55kg (120 lb) S-200 galvanised Spade. John advises that you should go, if possible, two sizes up from the table specifications. He gives a number of compelling reasons for it. 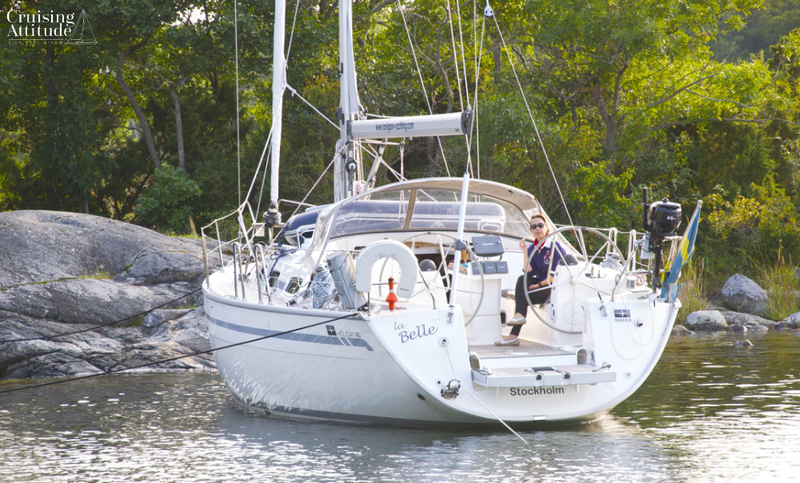 He jokes that if the marina isn’t laughing about the size of your anchor, it’s not big enough. According the Spade Anchor Selector wizard, for a boat that’s 55 feet, for extended cruising and difficult sea beds, you should chose the 37 kg (lb.) S-160. The next model up is the 44 kg S-180, and then you have the S-200 that we chose. 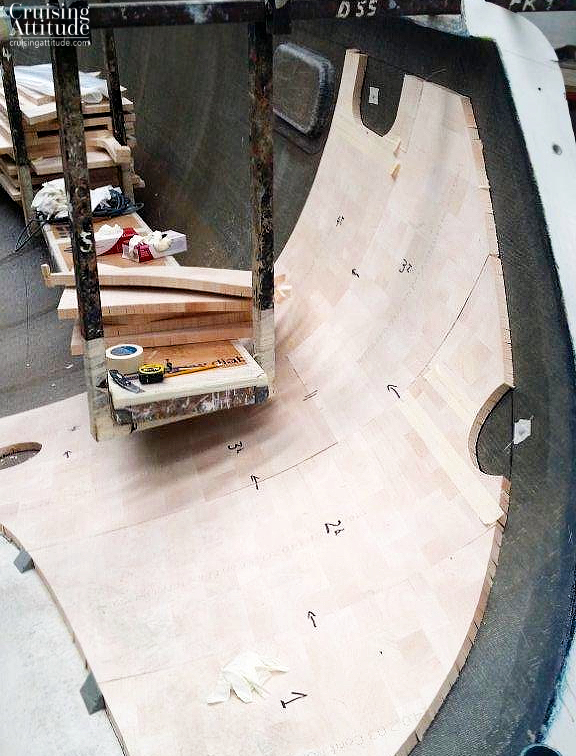 We wanted the shoal keel to give us more possibilities in the archipelagos of Scandinavia. 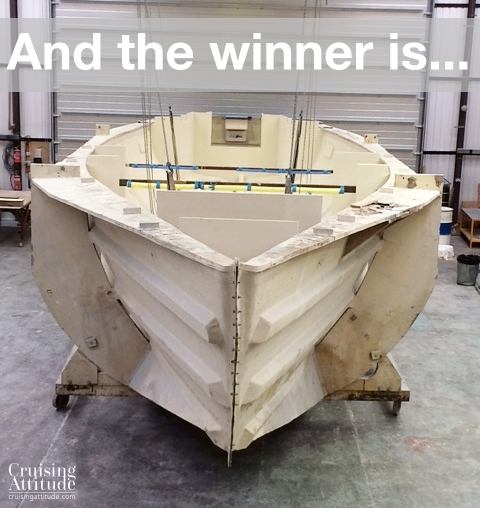 We were to be the first 55 with a 1.8 metre (5.9 ft) keel. Discovery now had the answers to this three questions and could officially move our boat into the construction pipeline. The build was to begin in February 2014. 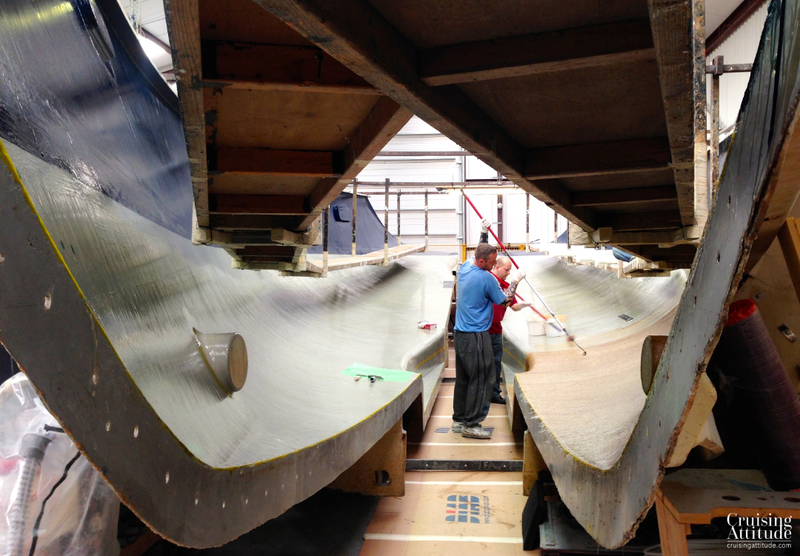 The laminating process begins – and here are the first photos of Freja. We had to decide about everything that has through-holes since the balsa layer needs to be cut out from each of the hole areas. 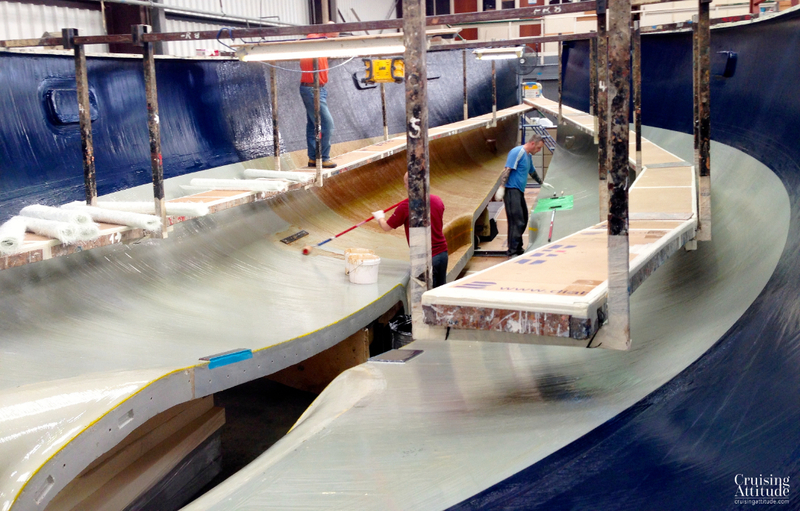 Gelcoat and epoxy layers finished – first layers of fibreglass go in the mould. The end-grain balsa wood layer going in. This is the insulation layer. 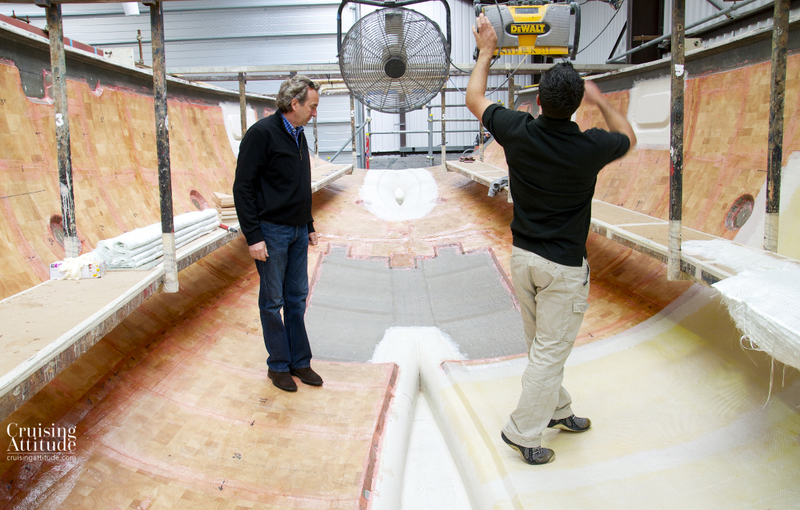 Kevlar layers are added for extra strength at the front of the hull. The yellow sheets are Kevlar, the white sheets are fibreglass. 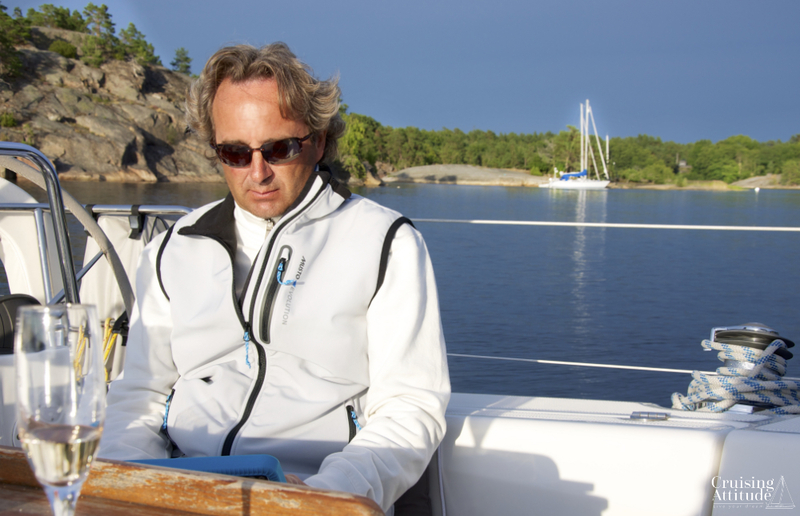 We cruised the Stockholm Archipelago in 2013 to get some more miles under our belts, in preparation for acquiring our own boat. 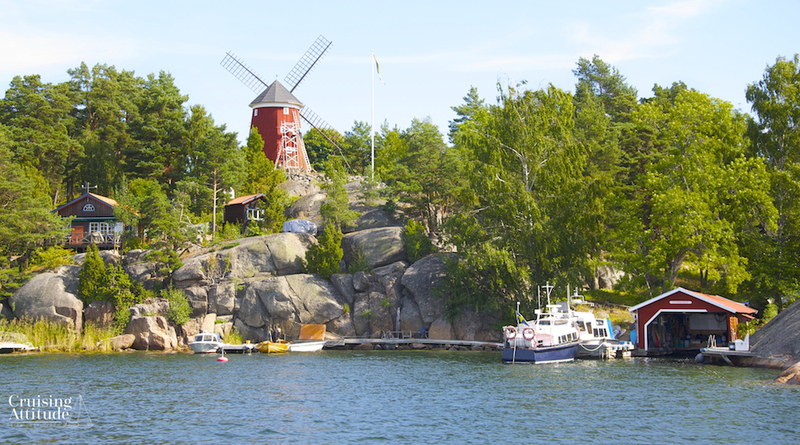 The sail from Utö to Munkö was gorgeous, thanks to the beautiful weather and to a guide called “Genväger i Stockholms Skärgård” (Shortcuts in the Stockholm Archipelago). It shows you little-known passages as alternatives to the “usual” way of getting somewhere. If you’re in Sweden, and are planning to explore the Stockholm area, I would really recommend it. Even if you don’t speak Swedish, the overhead photos and diagrams will enable you to follow along (you still need the chart, of course). This set of charts shows our route. The day dawned with grey skies and a light drizzle. We were so disappointed since yesterday evening showed us clear skies until we turned in for bed. We had hoped the forecast for rain in the morning was wrong. Today’s plan was to reach Lökaön, a large island with a perfect natural harbour on its eastern side (Österviken). We had a forecast for wind from the northwest, so this anchorage would be perfect. 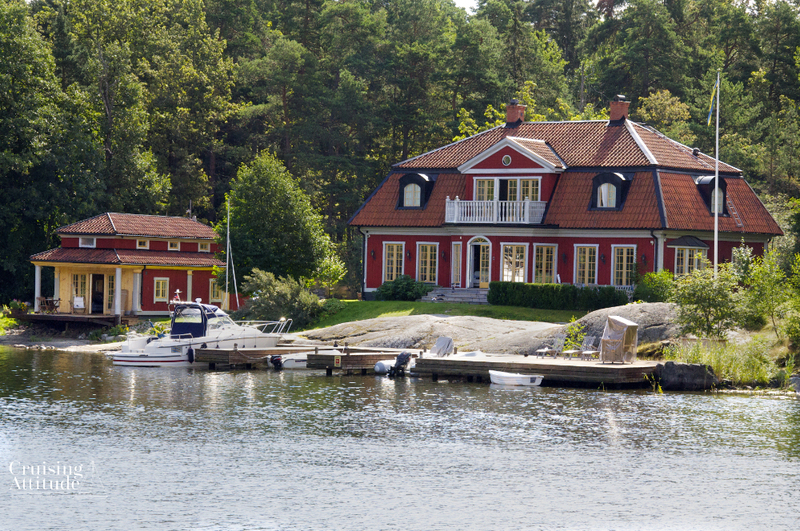 Lökaö builds together with the islands Storö and Bockö the largest nature reserve in Stockholm’s archipelago. Our route took us around the eastern side of Sandön and Korsö, around Björkö and then almost directly north to take us to a channel through a group of islands that includes Lökaön. Stockholm’s version of Cowes. Sandön is home to a large marina and village called Sandhamn. It’s Stockholm’s version of Cowes, and is rather lively during the high season between the midsummer holiday at the end of June and the beginning of August. If you’re not the type that enjoys rock concerts and partying young (and not-so-young) people making lots of noise, don’t spend the night here during the high season. We arrived at Österviken under a double rainbow – the rainy weather was on it’s way out towards the east, and we had a few rays of sunshine as we prepared to anchor in the middle of the harbour. Large natural harbour with room for lots of boats. Excellent places to tie up to land. Be very careful of the underwater rocks shown on the chart. I’ve seen (and heard!) a few boats hit them. 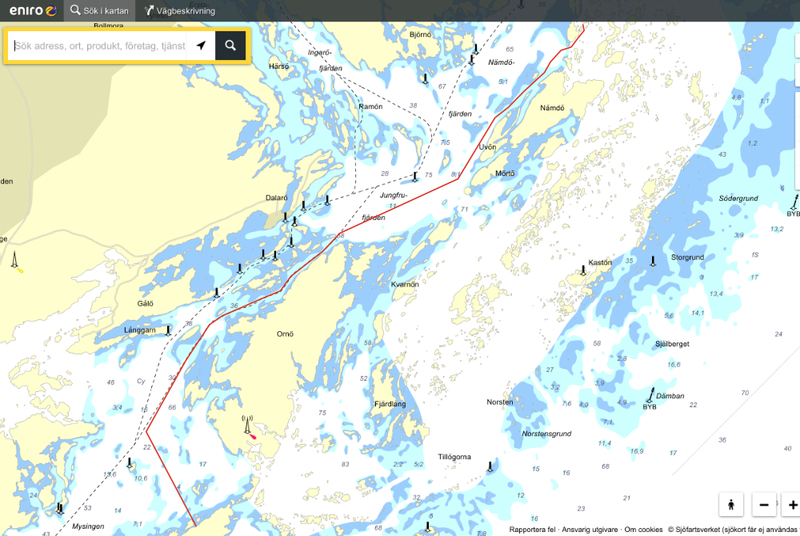 The north side of the island has several popular anchorage spots including Saffransskäret and Lilltistronskäret, but since they are not at all protected, this area is suitable only if the forecast is for no wind, or just a weak southerly. The sun was back and it was a good thing because today we would be picking our way through some of the rockiest parts of the archipelago. We would need to tack our way north as we now had a wind direction of NNE. The channel that leads from just north of Lökaö up through the rocks and skerries to just south of Tjockö is well-marked and easy to follow, but when tacking, you sometimes find yourself just outside the channel. That could easily lead to a grounding as the outer edges of the channel are strewn with underwater rocks. 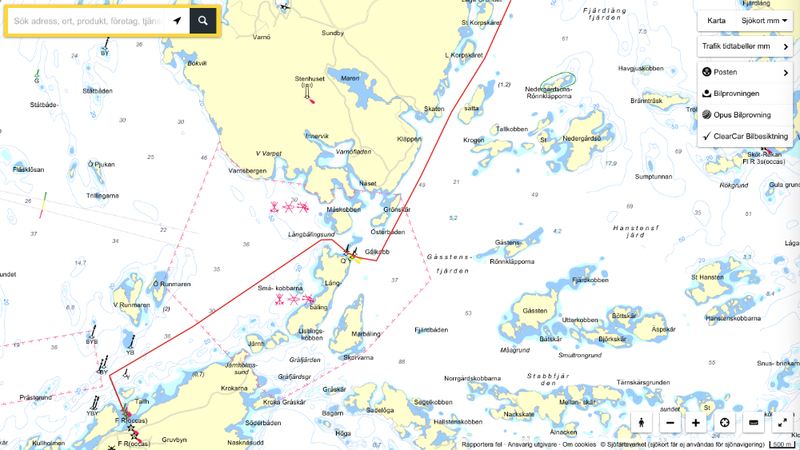 In retrospect, Granhamn wasn’t the best choice of an overnight anchorage. It’s quite small, so when we arrived at around 16.00, it was almost full. We tried setting our anchor, but the bottom doesn’t provide enough holding for the amount of rode we could put out. 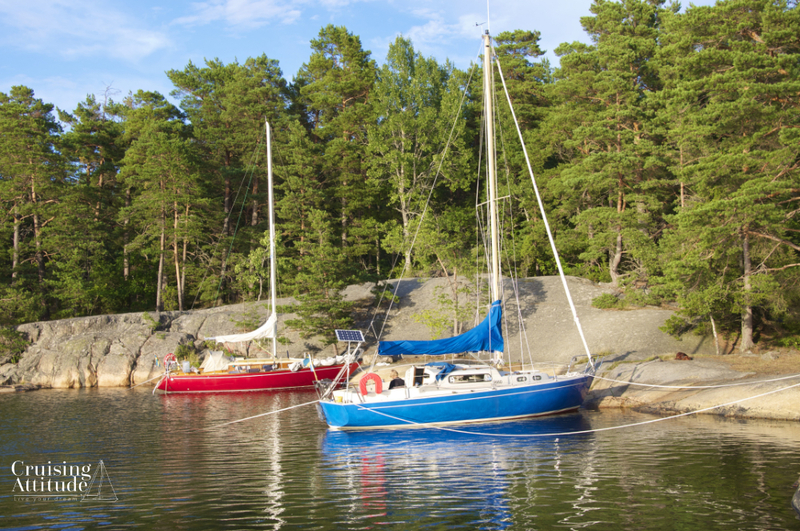 We ended up squeezing into a space to moor to land (the Swedish tradition of mooring to trees or spikes set into the rocks together with a stern anchor). We had just enough clearance under our keel (the Bavaria 40 has 2.2 meters of draught) for the space that was available between another boat and a shallow beach. 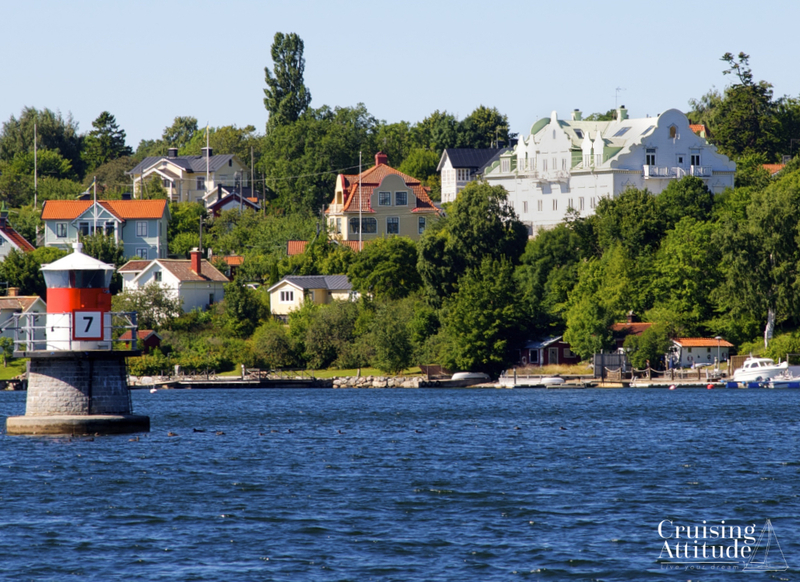 Granhamn is a traditional jump-off point for the passage to the Åland islands. 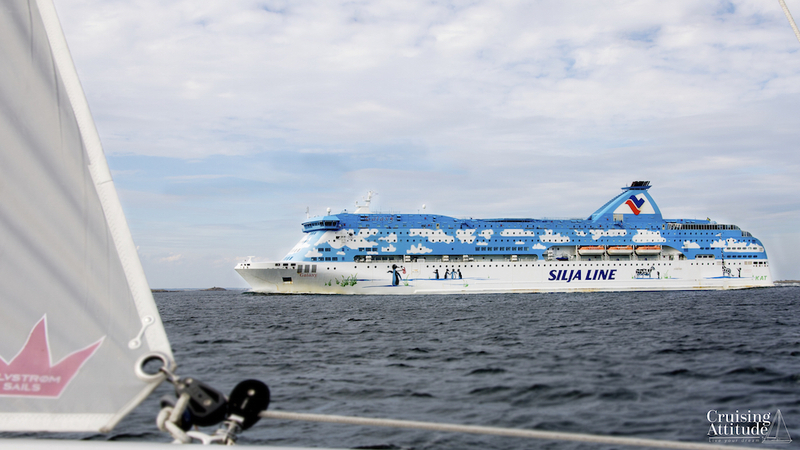 In the evening, you’ll see that big ferries to Finland and Åland steam by. It’s an amazing sight, as the ferries are like small glittering cities passing by your quiet anchorage. We saved the visit to Sandhamn for almost last as we wanted to get there late in the season. We are not big fans of noise and competing sources of music in the marina. 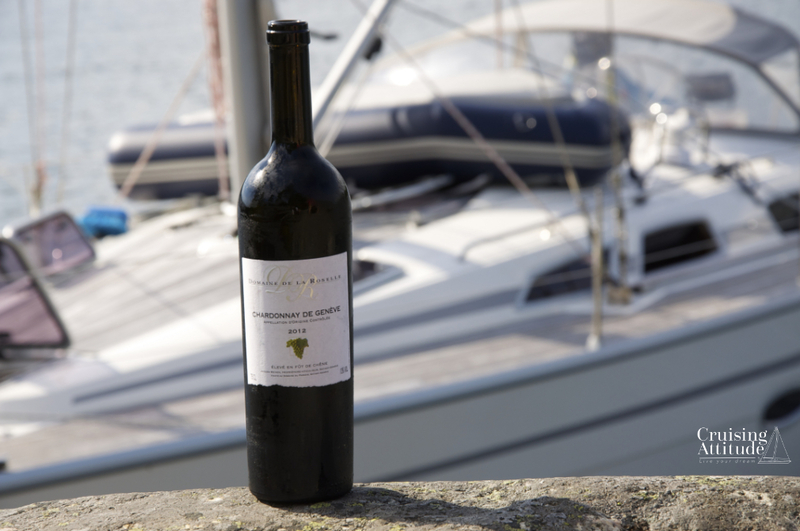 As it was after the 15th of August,and mid-week, a “low season” atmosphere reigned over the marina. Another marina across the fairway from Sandhamn called Lökholmen is much quieter and provides a boat shuttle over to Sandhamn. We arrived just in time to have a look at the summer pop-up shops, grab some groceries at Westerbergs and visit the charming little bakery. Later that evening, we had dinner of cold-smoked shrimp in the Seglarhotellet (Sailors Hotel), which has a lovely second-storey view over the marina. Tonight would be our last night in the archipelago, so I wanted to choose one of my favourites. The choice fell to Träskö Storö. It’s a large natural harbour protected from just about all winds except for north in some parts. Since most of the good places to moor to land were already crowded, we decided to anchor out again. We settled in the cockpit for a glass of wine and a book on our iPads as the sun slowly started it’s downward trajectory. An hour later we noticed a very slight sound of vibration. We checked to see if our halyards were perhaps too loose and were flapping with the little bit of wind we had. No. We checked to see if we were moving by taking a fix on a couple of distant rock formations. After 15 minutes, we were still in the same place according to the fixes. Then we thought maybe the flapping of the towels we had hung on the lifelines were causing the sound. We had dinner, took the fixes again and got the same degrees as before. We went to bed at around 22.30, but I woke up every hour to look out the porthole to see if we had moved. At about 3.30, I did notice that we were much closer to one of the little islands in the harbour and shouted to Jacques that we had dragged anchor and had to move the boat. Thankfully, there’s not much darkness in August at this latitude, so the sun had already been climbing for awhile. We weighed anchor and looked for another place. This time we backed down at 2,200 rpm instead of the 2,000 we usually do. The anchor held and now there was no wind at all. We were confident that the little Bruce anchor would hold. Now we know what that strange vibrating sound means! Fortunately, no harm done. Holidays can’t last forever, and the final day of our cruise arrived. We slept a bit later than usual, waking up at around 10 o’clock instead of the usual 7.00 or 8.00 because of our anchor “adventure”. After a last wonderful breakfast at anchor, we left for Lidingö, taking the long (eastern) way around the Saxarfjärden (“Scissor Fairway” in english). We wanted to stay out as long as possible because of the fine weather. 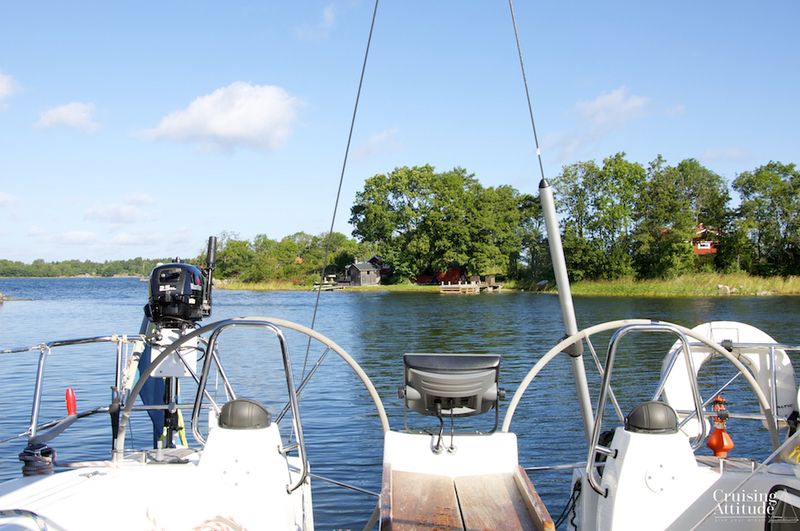 We filled the diesel tank at Waxholm, which has a choice of two fuel stations and a marina. The marina itself is just in front of the main street. You’ll find boutiques, art galleries, cafés and restaurants as well as grocery stores, a pharmacy and one of the state-run wine/beer/liquor shops called “Systembolaget”. From there it is a short hop to Lidingö’s Gåshaga marina. We arrived at around 17.00 and went through the usual inspection procedure when chartering. After dinner at the restaurant at the marina, we enjoyed our final night on the boat. It was now August 2013, and we were in the midst of deciding which boat we were going decide upon. We thought a bit sailing in familiar waters would help us in the decision process. 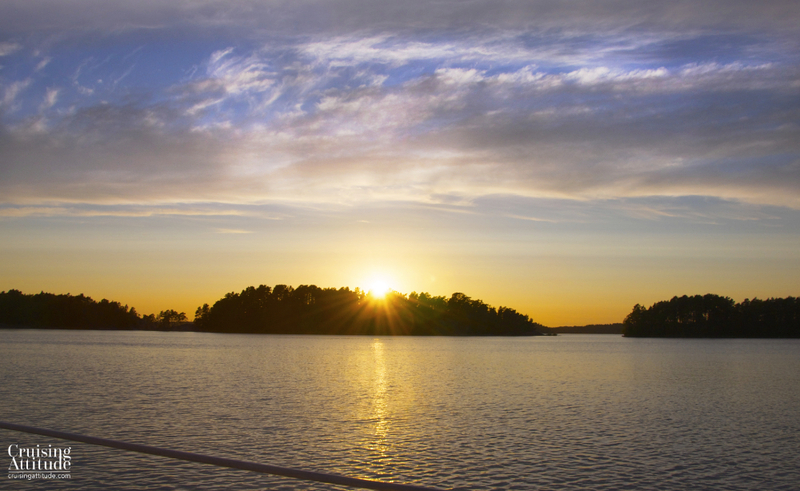 It had been a long time since we last cruised the Stockholm Archipelago — June, 1996 to be exact. 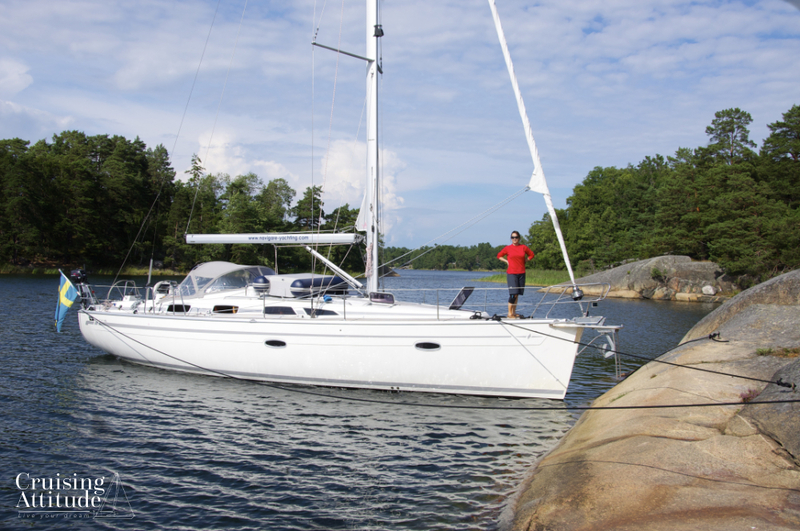 We bareboat charted a Bavaria 40 from Sail Sweden, based in Gåshaga on Lidingö, a short distance from Stockholm. Lidingö is the island on which I lived back in the late 80’s to early 90’s. We first stopped at the Östermalmshallen (a wonderful food market in Stockholm) to buy some Skagenröra (Danish/Swedish shrimp salad) and Kräftröra (crayfish salad) at Lisa Elmqvist and a few other items such as Västerbotten (the tastiest Swedish cheese) at Husmans Deli. If you’re in Stockholm, you must go to Östermalmshallen! Click here for an image of this treasure from the 1800’s. The second stop was the ICA supermarket in Larsberg, which has an amazing selection of high-quality food, including a great selection of organics. This was the supermarket I used to go to back in the 80’s and it was not at all like this! We finally arrived at the marina and were welcomed onto the boat and given time to organise our shopping and our baggage. We then went through the functional, safety and security aspects of the boat with one of the owners of the charter company. 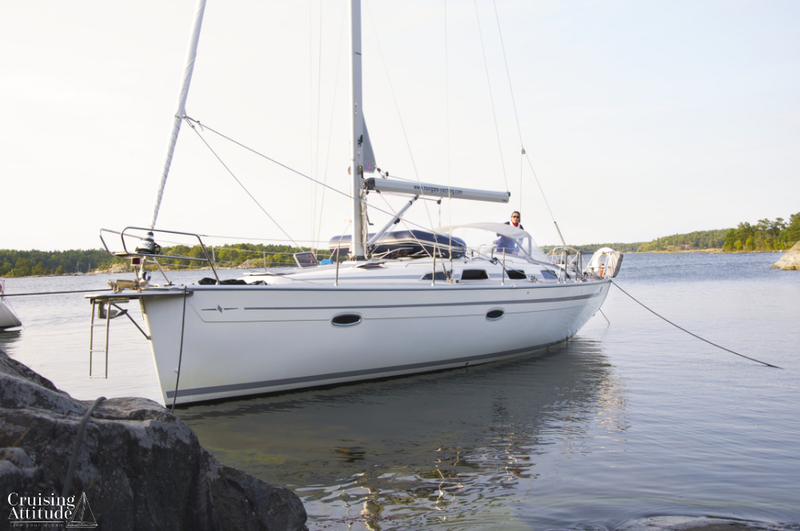 When you charter a boat, it’s important to ask where all of the safety and security items are stored – sometimes it’s not the most logical area! It’s also a good idea to ask how the VHF works if you’re not familiar with the brand that’s installed on the boat. By the time all of the preliminaries were dealt with, it was around six-thirty. We were exhausted, having driven up from Helsingborg the same morning (about a 6-hour drive), so we thought it best to get some rest and start early tomorrow. The day dawned a bit grey and misty, a disappointment after yesterday’s fabulous sunshine, but we left our mooring with a strong sense of excitement, eager to rediscover this fantastic sailing area. Tillbaks i skärgården! Back in the archipelago! 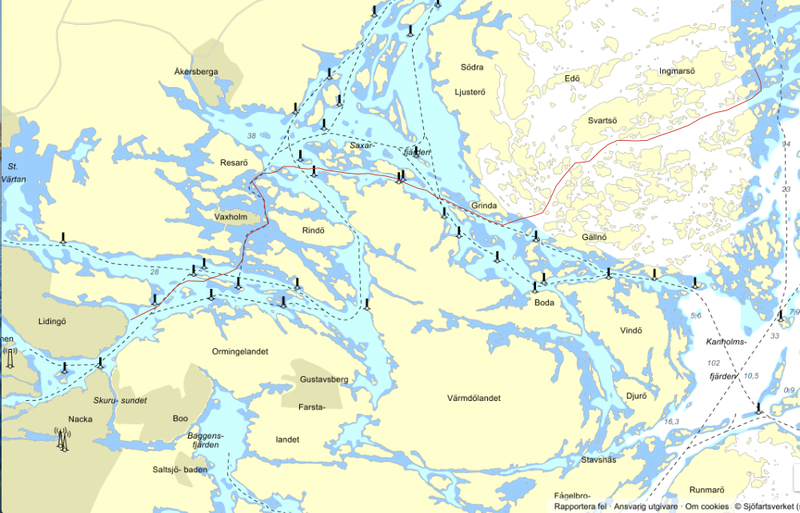 The Stockholm archipelago has over 30,000 islands and many more rocks and shoals making it a difficult place to navigate, if you’re not accustomed to always checking your chart. Fortunately, there are no tides, so the depth of these rocks doesn’t change in a dramatic way. The water level does rise and fall with weather conditions, though, so be careful with strong high or low pressure conditions. A high pressure system will push the water level down and out of the Baltic via Denmark, and a low will allow more water to flow into the Baltic, raising the water levels. I’ve seen differences of around almost a meter. 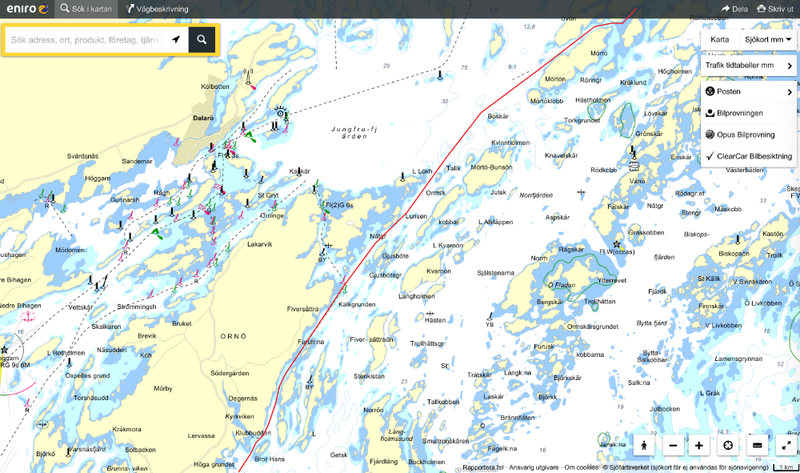 Our route took us past Waxholm, with its 16th century fortress, through Lindalsundet, past Grinda island, and finally to the well-known anchorage of Paradiset. 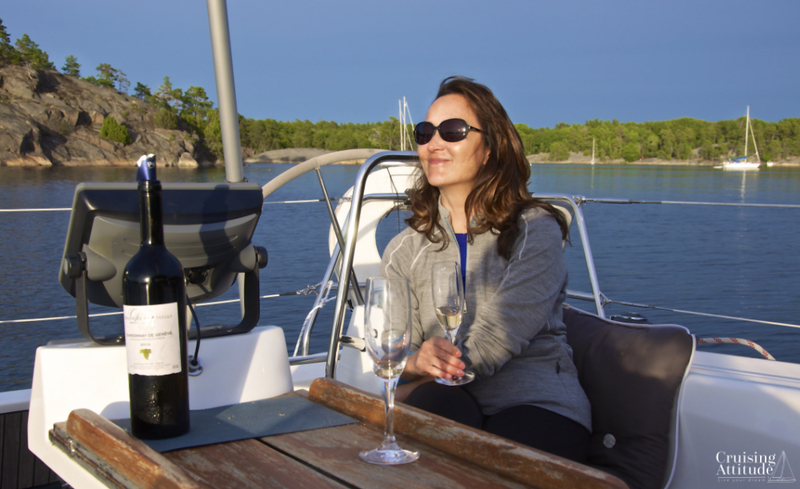 We enjoyed a lovely afternoon with a glass of our own Chardonnay on the low granite cliffs in front of the boat. Enjoying a glass of our own wine, a chardonnay from Domaine de la Roselle, at Paradiset. The perfect anchorage on a perfect day. Bad points: Could be overcrowded and loud during the high season and weekends as it’s popular for families with small children. We ended up on Gräddö because of a genoa failure. We had intended to sail farther north to Arholma, when suddenly, the leading edge (luff) of the genoa ripped off the rest of sail. We were running with about 15 knots of wind – not exactly storm conditions. We called the charter company, and they arranged for a sailmaker to be standing by when we returned to repair the sail. 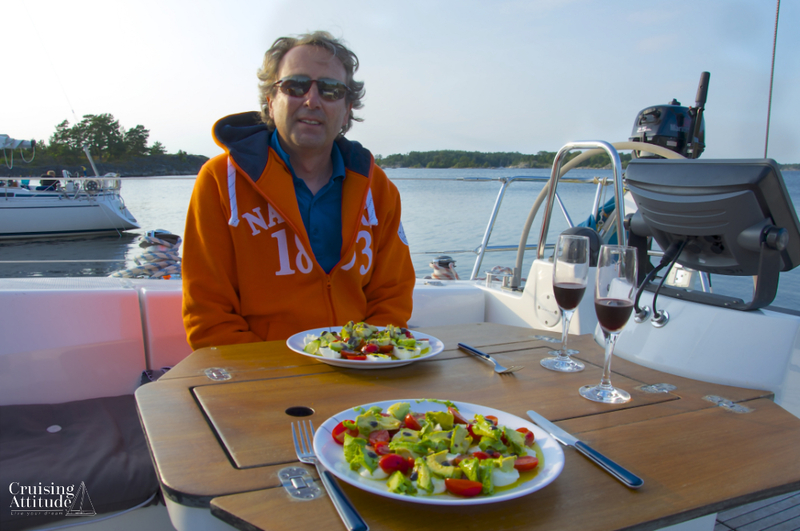 We had an early dinner and bedtime at Gräddö because it would take us nearly the entire day to get back to Lidingö. Good points: Calm, quiet, well protected for all but north winds. Fuel dock, showers, sauna, toilets and laundry room. There’s a grocery store about 500 meters away. 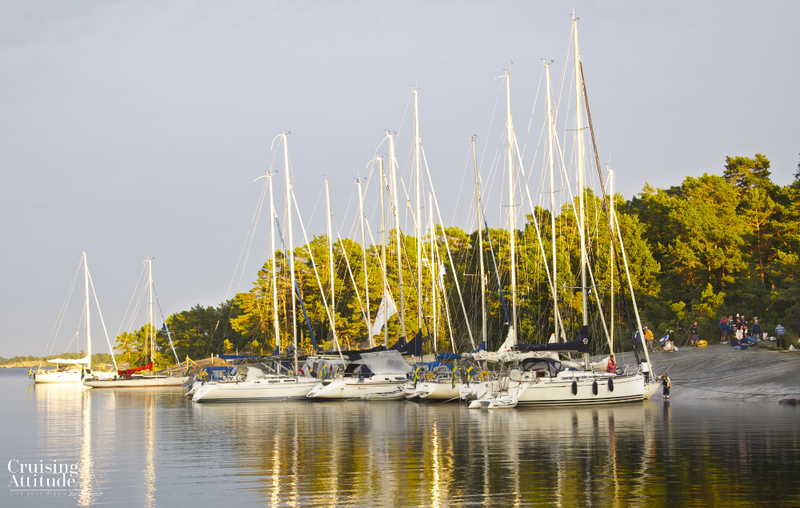 Bad points: Small, may not be suitable for boats of over 45-50 feet, as the mooring buoys are probably not far enough away from the dock. 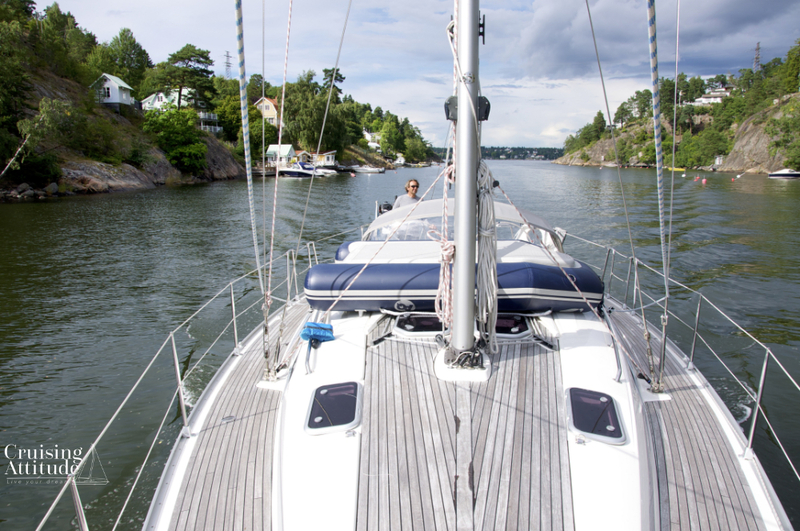 After having spend our entire third day, getting back to Lidingö, and half of our fourth day getting the sail repaired, we finally got under way at about 15.00. I decided that Napoleanviken on the nature reserve island of Ägnö would be a good goal for the day. It’s a favourite Friday night anchorage since it’s not far from Stockholm, it’s gorgeous, it’s quiet, and it has lots of room so you can find a place to anchor even if you arrive in the evening. 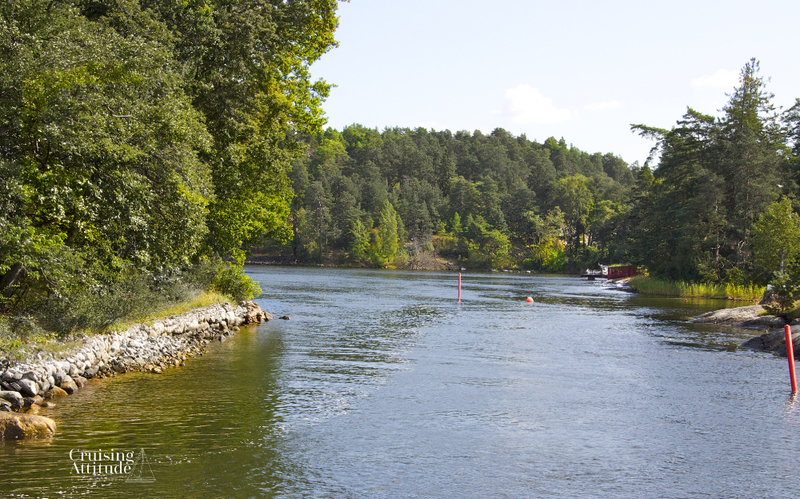 To get there, you need to pass through three different canals, the Skurusund, the Lännerstasund and the Baggenstäk. It’s an interesting voyage with lots of fabulous houses lining the banks of the canals. The first two canals are “normal-sized” — most traffic can pass side by side with lots of room to spare. The third, however, is really narrow. If you meet one of the archipelago passenger boats (boats that act as public transport for the island and coastal population) in one of the skinnier parts of the Baggenstäk, you may just have to back up to let them through. You are required to go through the Skurusund and the Baggenstäk under motor if you have one. This is the entrance when entering from the Stockholm side of the Baggenstäk canal. It’s quite narrow, and you don’t see what’s coming around the bend. Before going through the Baggenstäk, keep your ears open to channel 16. Most of the bigger boats will warn other traffic they will be entering so you can take action to wait them out. They will also sound a warning before entering – one long whistle. Don’t forget that passenger boats in regular traffic have priority over leisure boats. One of the narrowest places in the “Baggenstäket” canal. One of the many charming homes you see along the canal. 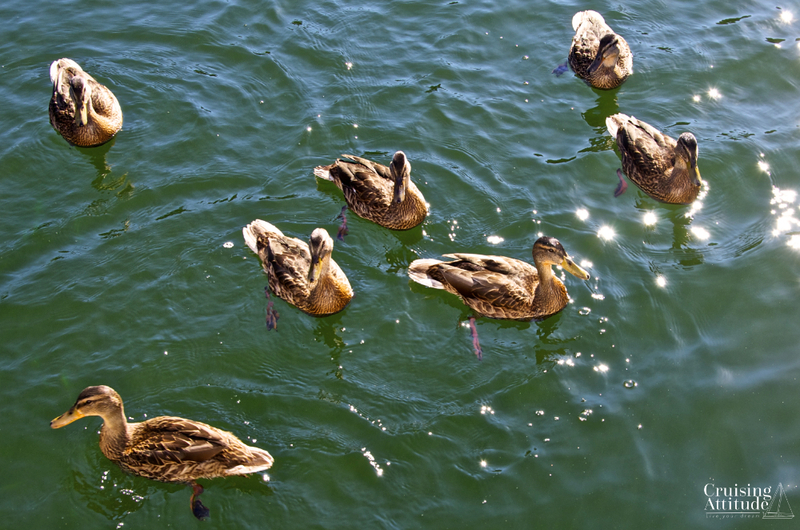 The sunny weather continued, and we had a leisurely breakfast in the cockpit with a pretty flock of ducks floating around the boat. They know to stay close if they want something to eat. We observed them paddling from boat to boat asking for donations. Company at breakfast time in the Napoleonviken. Having a leisurely breakfast in the beautiful anchorage of Napoleanviken on Ägnö. 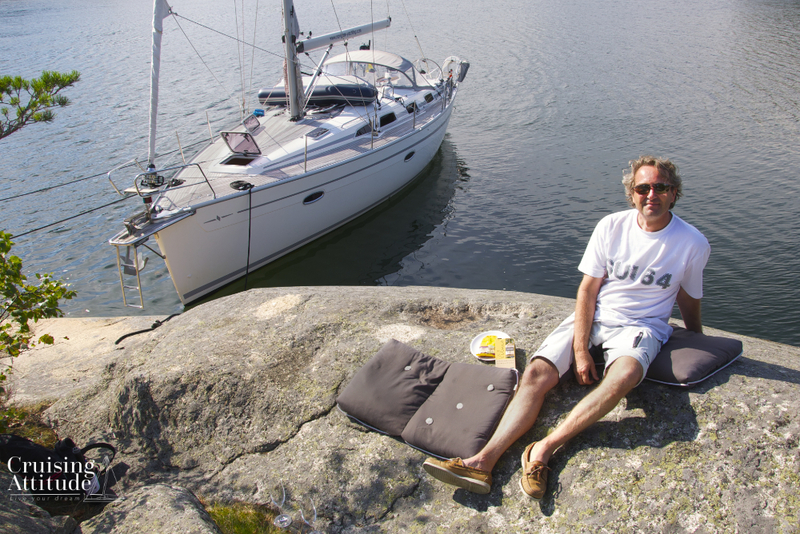 Today’s plan was to sail to Utö, one of our favourite islands. 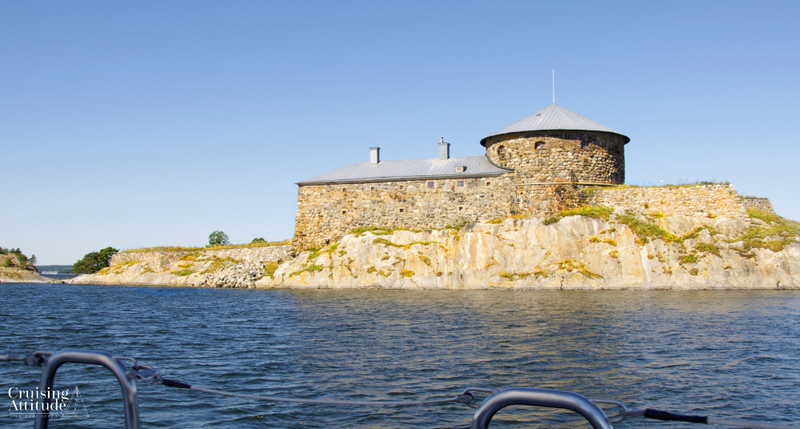 Our route would take us past Dalarö and the Dalarö fortress. The fortress at Dalarö, called Dalaröskans. The village of Dalarö is worth a stop – at least for a couple of hours. The small shops and cafés are wonderful. We highly recommend the Bistro Solsidan. In 1996, we were forced to spend three days here during a force 9 gale, and we were lucky it was here and not somewhere boring. 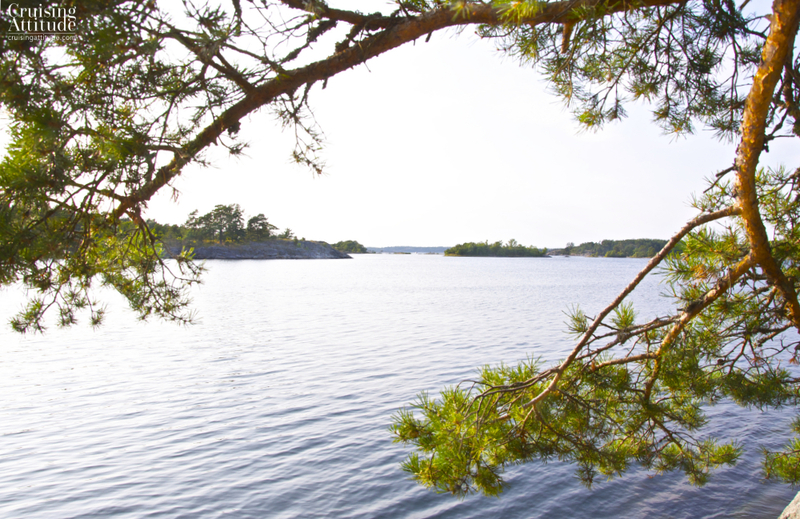 View of Dalarö in the southern Stockholm Archipelago. 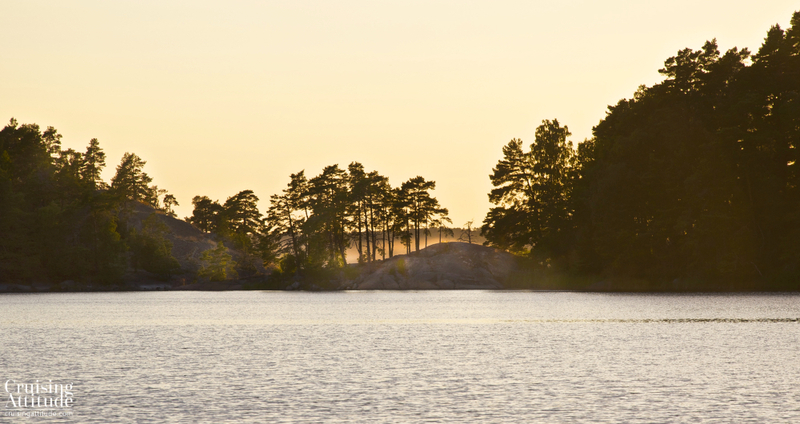 Utö has the advantage of being on the outer edge of the archipelago. It’s name means “out island”. The inland side, where the marina is located, is protected from the offshore winds and waves. The outer side gives you a fantastic view of the open Baltic sea. Perfect for a picnic, a swim or just a glass of wine on the cliffs. Beautiful cliffs facing the open Baltic Sea on Utö. You can see the evidence of my sprained knee in this photo. The island was a used back in the day as a iron mine. From the 1100’s until the end of the 1800’s, iron mining was the main activity of the island. At the beginning of the 1900’s people started using the island as a summer holiday resort. 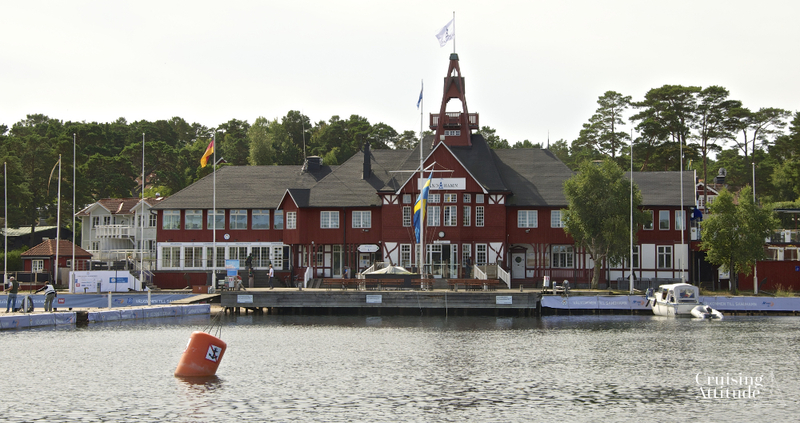 A glamorous restaurant and hotel, the Utö Wärdshus, was built towards the end of the 1800s and attracted the celebrities of Stockholm. It’s still open today. You can still see the vestiges of the iron mines. They’ve been filled with water, but you can still see where they are if you follow the signs that say “gruva”. 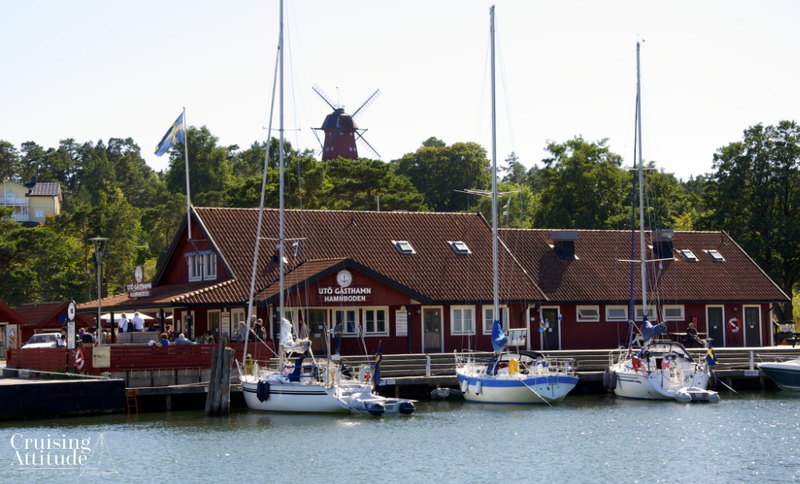 The area around Utö marina hosts several restaurants, cafés and bar as well as a fantastic bakery. There’s a well-stocked grocery store and a few boutiques that sell clothing, artisan-made home/boat ware, fresh seafood and souvenirs. You can also rent bikes and kayaks to explore the island. Utö Marina. The old windmill dates from the 1700’s and serves as a handy navigation mark. It’s open for visits. 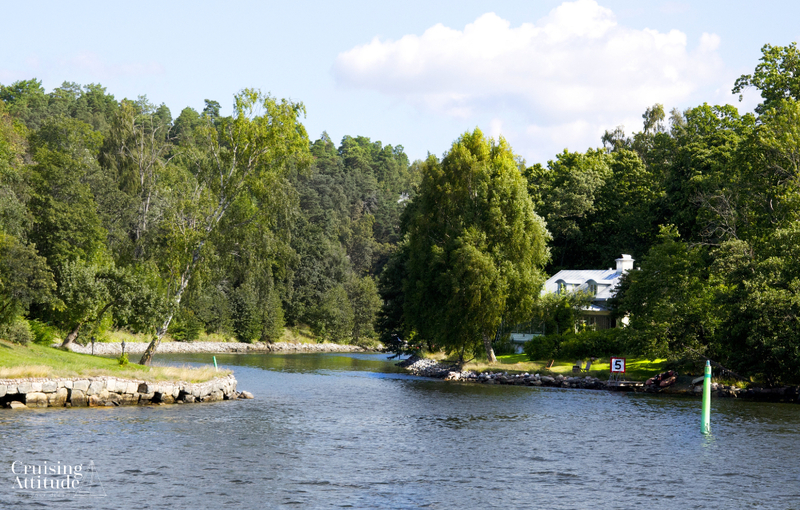 Prices: 225 SEK for a day (between 15.00 to 13.00) Includes Sauna, showers, toilets. The maximum depth is 3 meters, but boats with more than 2.2 meters draft need to reserve a berth with the marina office at 08-501 574 50. Other facilities: laundry, kiosk for magazines, ice cream, coffee and snacks. Grocery store, bakery and other shops nearby.